The thirteenth edition of the FAB 50 National Team Rankings powered by Ballislife.com for the 2017-18 season sees plenty of change and nine new teams, led by state champs Meadowcreek (Norcross, Ga.) at No. 25 and Allen (Allen, Texas) at No. 26. With many top-ranked and bubble clubs closing out the season with state titles, we are now at the point of the season where we try to reward teams still alive in the playoffs, but just can’t ignore teams that lost earlier than expected who played a national schedule. The GEICO Nationals field is now coming into focus with three more FAB 50 updates to go this season. Many top-ranked teams from around the country have now completed their 2017-18 season and that is reflected in the updated FAB 50 National Team Rankings powered by Ballislife.com . Teams marked with an asterisk (****) are done for the year, but it doesn’t mean they won’t move around in the final three rankings shuffles for the school year. Some teams didn’t win state titles, but have too many quality victories to ignore. One of those teams is Guyer (Denton, Texas), which moves up 12 spots this week to No. 30 after Allen (Allen, Texas) won the coveted University Interscholastic League (UIL) Class 6A state crown with a 49-47 overtime win over Tompkins (Katy, Texas). Allen is the second highest ranked newcomer this week at No. 26, as the UIL Class 6A state champ has deserved to be highly-ranked in recent seasons. Allen’s Donovan Parham converted the dramatic game-winning lay-up with 1.1 seconds remaining after receiving a half court inbounds pass. Jaylen Walker netted 18 points for the Eagles and was named tourney MVP. Allen, which defeated previous No. 38 Westlake (Austin, Texas) 70-55 in its state semifinal contest, defeated Guyer, 40-36, in a regional final, but lost to the Wildcats two times in three games this season. Having a win over Allen is the reason the fourth Class 6A semifinalist, South Garland (Garland, Texas), doesn’t drop out of the FAB 50. The No. 44 Colonels fell to Tompkins, 80-76 in the other semifinal contest. South Garland, which has a loss to Guyer, not only defeated Allen earlier in the season, it also split games with Tompkins. Norcross (Norcross, Ga.) was eyeing a GEICO Nationals berth, but it came crashing down when the Blue Devils fell to cross-town Meadowcreek, 56-43, in the GHSA Class AAAAAAA state final. The Mustangs are the highest-rated newcomer, cracking the Top 25 after defeating the club that knocked off then No. 4 McEachern (Powder Springs, Ga.) in the state quarterfinals. Norcross only dropped one spot to No. 33 despite the loss because coach Jesse McMillan’s club defeated Meadowcreek in three of four meetings this season. Two of Meadowcreek’s other three losses to clubs besides Norcross were overtime games, including a 58-51 setback to No. 8 and WCAC regular season champion Paul VI (Fairfax, Va.). It would have been better for McEachern if Norcross won the state crown, but their overall resume is just too good to warrant a complete drop out of the FAB 50. Mike Thompson’s club owns wins over No. 4 Simeon (Chicago, Ill.) and No. 41 Hudson Catholic (Jersey City, N.J.), but it remains to be seen how much more McEachern may drop based on results around the country. The underclass-dominated team obviously would like to see Simeon capture the ISHA Class 4A crown. Texas and Georgia are not the only states where top-tier teams have played multiple times with the lower-ranked teams coming out on top when it matters most. It’s happened in Oregon and Maryland and we could have similar scenarios in California. As some teams are finding out, it’s very hard to beat a good team three or four teams in the same season. With Norcross going down, it opens up the door up for a program from another state association to perhaps get a nod. 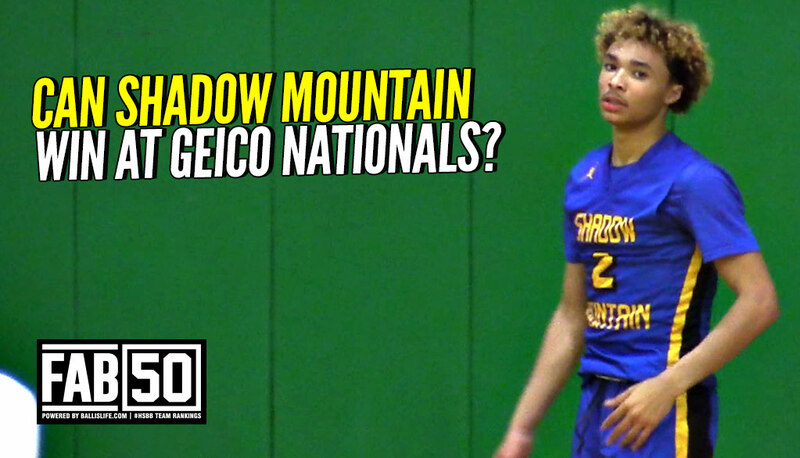 The more associations that allow their state champ(s) to participate is good for the future of Geico Nationals and moving towards a true national high school championship. Despite winning the GHSA Class AAAA state crown and finishing the season with a 63-game winning streak, it doesn’t appear No. 15 Upson-Lee (Thomaston, Ga.) will receive an invitation. The Knights closed out their season with a 70-54 victory over St. Pius X (Atlanta, Ga.) despite having three squad members arrested after their semifinal win. Those players did not participate in the state title game, but Tye Fagan, a Middle Tennessee recruit, picked up the slack by netting 21 points and 10 rebounds, according to sandysspiel.com. No. 1 Montverde Academy (Montverde, Fla.), No. 2 Oak Hill Academy (Mouth of Wilson, Va.), No. 3 University School (Ft. Lauderdale, Fla.), No. 6 Findlay Prep (Henderson, Nev.), No. 9 Shadow Mountain (Phoenix, Ariz.) and No. 10 La Lumiere (LaPorte, Ind. ), the defending tournament champions, will be in attendance at the event slated for March 29-31 in New York City. It appears the final two slots will be awarded to state champions from Washington and Utah. Dropped Out: Previous No. 21 Salesian (Richmond, Calif.), No. 24 Mater Dei (Santa Ana, Calif.), No. 25 Gill St. Bernard’s (Gladstone, N.J.), No. 35 Jefferson (Portland, Ore.), No. 38 Westlake (Austin, Texas), No. 45 John Carroll (Bel Air, Md. ), No. 47 ThunderRidge (Highlands Ranch, Col.), No. 48 Meridian (Meridian, Miss. ), No. 49 Northside-Jax (Jacksonville, N.C.). Bubble Teams: Abington (Abington, Pa.) 23-5; Belleville West (Belleville, Ill.) 29-2; Bergen Catholic (Oradell, N.J.) 24-3****; Bishop Miege (Shawnee Mission, Kan.) 22-3****; Bishop O’Connell (Arlington, Va.) 30-9****; Bishop O’Dowd (Oakland, Calif.) 26-5; Chaminade (St. Louis, Mo.) 24-4; Columbus (Columbus, Miss.) 27-6****; Cretin-Derham Hall (St. Paul, Minn.) 26-2; Curie (Chicago, Ill.) 26-5****; Don Bosco Prep (Ramsey, N.J.) 27-2; East Catholic (Manchester, Conn.) 24-0; Fairfax (Los Angeles, Calif.) 23-9; Gill St. Bernard’s (Gladstone, N.J.) 24-5****; Gonzaga (Washington, D.C.) 28-9****; Grandview (Aurora, Col.) 24-4****; Grant (Portland, Ore.) 24-4****; Greensboro Day (Greensboro, N.C.) 27-7****; Independence (Charlotte, N.C.) 31-1****; Jefferson (Portland, Ore.) 26-4****; John Carroll (Bel Air, Md.) 29-8****; Lake Taylor (Norfolk, Va.) 25-1****; Lone Peak (Highland, Utah) 23-3; Mater Dei (Santa Ana, Calif.) 23-7****; McPherson (McPherson, Kan.) 22-2****; Memorial (Tulsa, Okla.) 27-2****; Meridian (Meridian, Miss.) 31-2****; Modesto Christian (Modesto, Calif.) 29-3; Mountain Brook (Mountain Brook, Ala.) 34-5****; Mt. St. Joseph (Baltimore, Md.) 28-8****; Newton (Covington, Ga.) 27-4****; North Little Rock (North Little Rock, Ark.) 25-5****; Northside-Jax (Jacksonville, N.C.) 29-1****; Oshkosh North (Oshkosh, Wis.) 25-1; Plymouth-Whitemarsh (Plymouth Meeting, Pa.) 28-1; Putnam City North (Oklahoma City, Okla.) 25-5****; Ranney School (Tinton Falls, N.J.) 28-5****; Salesian (Richmond, Calif.) 30-2****; Spartanburg Day (Spartanburg, S.C.) 20-8****; Solon (Solon, Ohio) 24-1; Tompkins (Katy, Texas) 32-9****; Trinity Episcopal (Richmond, Va.) 26-4****; Webster Groves (Webster Groves, Mo.) 20-9; Wesleyan Christian Academy (High Point, N.C.) 27-6****; Westlake (Austin, Texas) 36-4****; Whitney Young (Chicago, Ill.) 26-7.